Full instructions on how to build a very clever automatic chicken coop door opener, using a cheap automatic car antenna and a timer. There are heaps of photos of every step, making the instructions very easy to follow. These people have a much fancier chicken coop than me! Found via The Walden Effect. 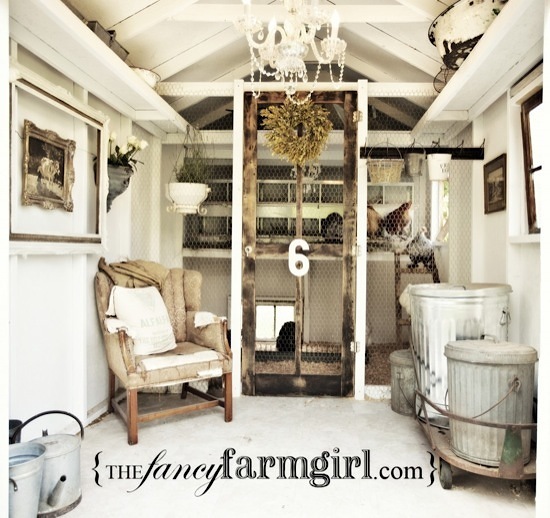 Speaking of fancy coops, this is the most amazing chicken coop I have ever seen (click on the photo at right for a larger image). It does require cleaning out every day and a thorough cleaning bi-weekly, but if you’re willing to do the work the results are incredible! Just be warned that her web site plays annoying music – you have to scroll to the bottom of the page to turn it off (I hate sites that do that!). Found via The Unusually Unusual Farm Chick. In local news, the Kiama Community Garden now has a blog. It’s great to see the rapid progress being made at the site! The first issue of Backyard Aquaponics magazine is available for free online (and it’s an Australian publication!). This issue gives a very good introduction to aquaponics. Later editions can be purchased online for immediate download. I was reading up on aquaponics because the guest speaker at the February Jamberoo Community Growers meeting will be John Burgess from Fresh By Nature, talking about backyard aquaponics. I watched the movie Fresh on YouTube this week. You can start with the clip below, then at the end click on Part 2, then Part 3, etc to see the whole thing. If you liked Food, Inc, you’ll enjoy Fresh. Feel free to post links and suggestions in the comments below! I’m particularly interested in good sustainability-related movies, especially food-related ones with a positive message, for possible screenings by Jamberoo Community Growers this year. Some great links thanks. That is some chook pen! I’m looking forward to reading the backyard aqaponics mag and watching Fresh. Thanks.